Tiffany & Co. is arguably one of the largest and most established jewelry purveyors in the world. Unlike its newer competitors, Tiffany & Co. has a rich and illustrious history; it encapsulates and defines the magic of diamonds and has embedded its mark on American culture since the 1800’s. Its esteemed name has inspired novellas, music and films, and captured hearts and imaginations across the globe. To unravel the intricacies of such a household name, one enswathed in luxury and mystique, one must focus on two factors: quality and price. Yet, in the world of Tiffany & Co., it is impossible to not first explore the fascinating memoirs and exceptional execution of this distinguished brand. The Tiffany name started life in Brooklyn, Connecticut in 1837. Founded by Charles Lewis Tiffany and John B. Young, it established itself as a ‘stationery and fancy goods emporium’. By 1853, Charles Tiffany had taken control and placed the company’s focus on jewelry. Defying the societal norms of the era, Tiffany & Co. would only accept cash payments, did not accept payment by credit and did not allow the buyer an opportunity to haggle on price. This decision placed it in a market of cash ready buyers at the top of the social ladder. Tiffany & Co. continued to strive forward, building relationships with the U.S military, further stamping its mark on American history. It supplied the Union army with swords during the civil war and created a Medal of Honor on behalf of the United States Department of the Navy. In 1968 Lady Bird Johnson, the U.S first lady, commissioned Tiffany & Co. to design a fine china set for the Whitehouse. The company had its roots firmly set in American heritage, building a seemingly untouchable name. Tiffany’s flagship store is located on 5th Avenue in Manhattan, New York where it has proudly stood since 1940. The striking window displays and majestic granite exterior was immortalized by Audrey Hepburn, who gazed longingly in the windows during her performance in the 1961 film ‘Breakfast at Tiffany’s’. Tiffany & Co. has continued to expand with no signs of slowing down. The company now operates in over 22 countries with at least 121 stores in the U.S alone. This review does not fall into the same bracket as those of Blue Nile, James Allen or other online diamond retailers. 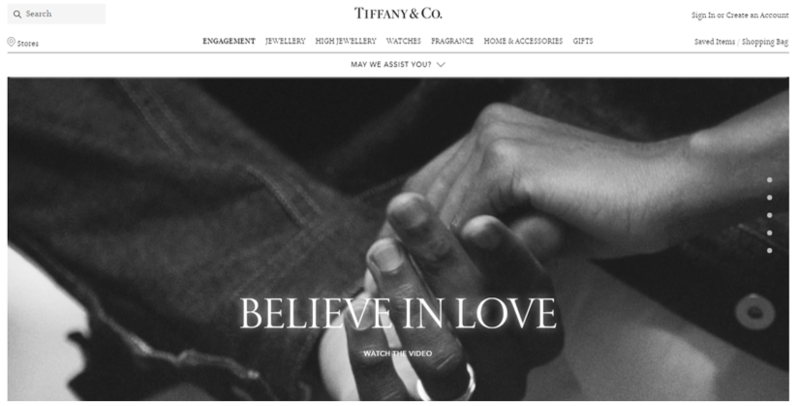 When using the Tiffany & Co. website one thing becomes clear from the moment you enter the page; it is all about the ‘Tiffany Experience’. It is for this reason (or so it is claimed), that engagement rings cannot be purchased online. In a modern world, this can seem refreshing. Choosing an engagement ring is an exciting venture, and certainly, an in-house experience contributes to those early memories of romance. It is also worth mentioning, however, that with skilled sales staff, shiny shop fronts and unquestionably exceptional customer service, getting a client into the store certainly gives Tiffany & Co. total control over who it sells to, and how it does it. Bells and whistles and glasses of champagne during its appointments can certainly make the premium on its jewelry a little easier to swallow. I cannot fault Tiffany & Co. for its dedication to exclusivity, or the appearance of it, and commitment to the Tiffany experience. Offering the buyer a chance to make an appointment certainly emphasizes the importance of the decision and adds a little twinkle of magic and prestige. However, if you do not live near a Tiffany & Co. store, you are more likely to find this marketing strategy an inconvenience. 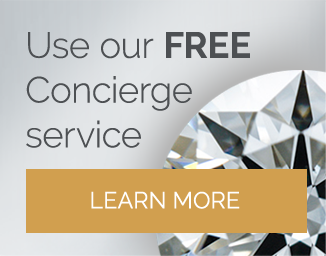 It does compensate for this; the initial stages of the Tiffany concierge service can be undertaken over the phone. This interaction oozes the sleek professionalism that we can expect of such an esteemed brand, but ultimately the only way to purchase a Tiffany & Co. engagement ring is by entering its sales process in a store. Other diamond jewelry can be purchased via the website, though it tends to be smaller grain set styles as oppose to solitaire pieces. 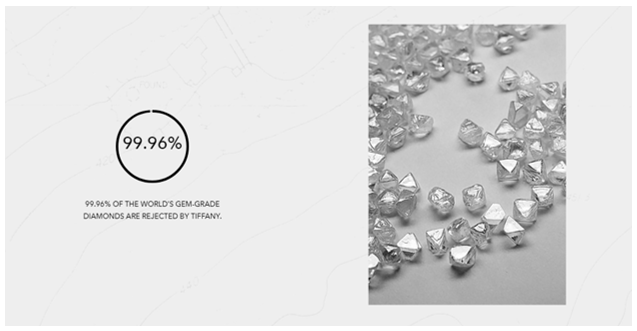 When it comes to diamond education, the Tiffany website suggests this is on a strictly ‘need to know’ basis. Impressive graphics with limited facts is its approach to educating the buyers. My experiences in-store with Tiffany & Co. demonstrate the wealth of knowledge its staff has at its disposal, however as is the Tiffany gospel, if you want more then you must visit a store. Nevertheless, the website itself is comprehensive and certainly gives a feeling of the opulence and history that it holds so dear. 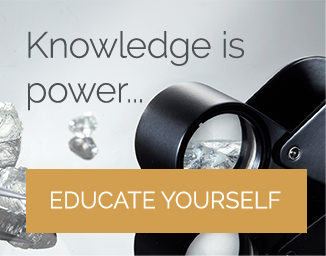 Armed with your newfound knowledge of diamond certification, you may expect to enter Tiffany & Co. to see an abundance of GIA certified stones. This is not the case. Tiffany & Co. does not work with any external institutes for the appraisal or assessment of its stones. This is all completed by Tiffany & Co. and its own diamond experts. While diamond certification is the holy grail of provenance and prestige for other retailers, for Tiffany & Co. its name is enough. With every diamond expert (myself included) hammering home the importance of certification, one may question why people buy from Tiffany & Co. at all. However, it is here that we must consider the unique position of Tiffany in the world of diamonds. It may not rely on certification from gemological institutes, but this does not mean its stones are of inferior quality. Those who have chosen to have their stones appraised elsewhere prior to purchasing cannot dispute the quality of a Tiffany & Co. diamond. While the pricing of Tiffany jewelry may be up for discussion, the quality of the stones they select is not. The blue box. There is little more that needs to be said for the packaging and finish of Tiffany & Co. for its boxes are as famous as the jewelry. The color, colloquially known as ‘Tiffany Blue’, was chosen by Charles Tiffany with the intention of making purchases stand out. Whatever criticisms or faults we may find with this powerhouse brand, the Tiffany box will always ignite a spark of excitement for those receiving it. It is another example of flawless marketing strategy, for this box itself is nothing special; it is not lined with a rare fur, or embellished with gemstones. It is what the box symbolizes and its inherent link with luxury and status that makes it so covetable. You will pay more for a Tiffany & Co. diamond. Tiffany will claim to work closely with those individuals who have a more ‘modest’ budget; however, it also knows that people are willing to pay large premiums on its diamond jewelry. Why? Because it is Tiffany & Co. 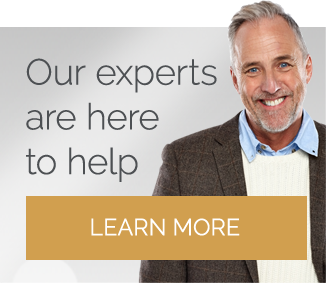 If you are considering a Tiffany & Co. diamond, it is important to accept you will have to make compromises to keep within your outlined budget. If you buy from Tiffany, you will walk away with a beautiful diamond, but this diamond may be smaller or of a lower quality when compared to its equivalent from a different retailer. Much like designer clothing, the cost of Tiffany & Co. jewelry allows a small amount of control over who is wearing it, thus maintaining its status as upmarket and exclusive. This approach echoes the early days of the company, and Charles Tiffany’s desire to appeal to the upper-class bracket of society. If you are fortunate enough to have an unlimited budget and want to indulge yourself in the archetype of historical luxury, then Tiffany & Co. is the perfect choice. 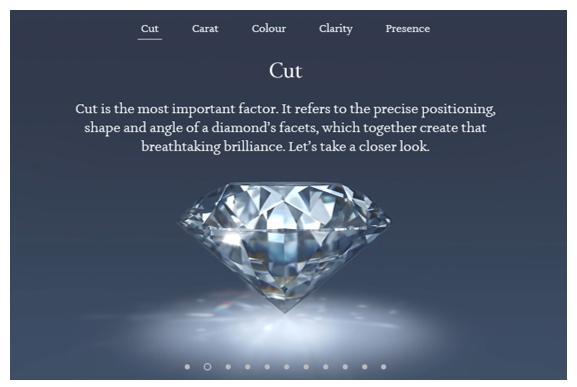 If you live near a Tiffany store and wish to engage in detailed discussions of your budget, quality, and possibility for your diamonds, then be prepared to be hypnotized and absorbed into the world of Tiffany’s. It is likely you will walk away that day with a piece of jewelry. However, if diamond quality and value for money are your priority, then Tiffany & Co. is unlikely to capture your heart. The diamonds are good quality, but you are ultimately paying for a name. It is a treasured name and it is a famous name…but it is still, just a name. Be sure to read my James Allen review and Whiteflash review to find out what kind of diamonds they can offer you with their in-house cut offerings, the A CUT ABOVE diamonds from Whiteflash are in my opinion the highest quality cut available and come with all the relevant light performance imaging as well.